My father was born in 1917. Earlier that year an officer in the German Foreign Office by the name of Arthur Zimmerman sent a coded message to the German ambassador in Mexico instructing him to offer military aid to Mexico if they would attack the United States. In return, Mexico was to be offered the states of New Mexico, Arizona, and Texas after the Germans had won the First World War. The telegram was intercepted by Britain and decoded. The Americans were informed and declared war on Germany three months later. In October of that same year the Bolsheviks overthrew Kerensky’s democratic government in Russia and promptly withdrew from the war effort by prior arrangement with the Germans who helped bring them to power. It was a turbulent and uncertain time in which to be born, but on October 12 of that year, thirty-four year old Louisa Townend gave birth to my father, Wyndham Townend Wise. The father of that child, forty-three year old Wyndham Kent Wise was not married to Louisa for the simple reason that he was already married to another woman, Gertrude. There were no children of that marriage, so my father was my grandfather’s only child. Apparently that didn’t count for much, for a few years after the war ended my grandfather sailed off to Shanghai leaving his wife, mistress and child behind. Undeterred, Louisa and her son sailed after him to Shanghai in late 1925 or early 1926 when Dad would have been eight. Shanghai was booming at that time as Britain was determined to restore and even enlarge its overseas empire now that Germany had been defeated. Shanghai boasted a defensible harbour and cheap labour. My grandfather was a building foreman, which was likely a valuable asset, despite having no Mandarin. He was also a scoundrel of the first order, and by the time Louisa and her young charge had arrived, my grandfather had already acquired a Chinese ‘wife’ and wanted nothing to do with his former mistress or the burdens of fatherhood. After a few weeks of pleading for him to return to England, Louisa accepted the inevitable and returned with young Wyndham from Vladivostok on the Trans-Siberian Railroad. By May of 1926 my father was back in England, and was enrolled at the Perse School in Cambridge where he remained for the next six years. Perse is one of the oldest and most highly regarded schools in all of Britain. It also offered free tuition to needy families at that time, which is likely what drew my grandmother. After graduating from Perse in 1932, my father, now 14, went Loughborough College in Leicester to study engineering. Loughborough was famous for its apprenticeship programs, which is likely where my father developed his mechanical competence. However, in September, 1935 my grandmother passed away in Cambridge, leaving my father without support and forced to leave school and find a job. Dad went to work at the Savoy Hotel in London as a bellhop. One of the guests, Raymond Mays, took a liking to young Wyndham, and offered him a job as an apprentice mechanic with his firm. Mays, fresh off his 1935 win at the German Grand Prix, was pre-war Britain’s most famous driver and racing entrepreneur, and the two car companies he founded, ERA and BRM are legendary in England. Mays was pretty legendary himself, a swashbuckling character who once drove from John O’Groats in Scotland to Land’s End in a single day, crossing the whole of England long before there were motorways. Dad thrived at ERA, and saw out his apprenticeship with the firm, developing a life-long passion for racing and race cars that he passed on to his two sons. However, this growing success was about to be interrupted by Hitler, as Germany invaded Poland on September 1, 1939, and England immediately declared war on Germany. Three months later, now 22 years old, my father volunteered in the war effort, joining the Territorial Army as an enlisted man. Within the year he was promoted to Second Lieutenant and his unit was ordered to Dorset in preparation for assignment to East Africa. The Green Howards, as his unit was called, were massed near the militarily significant British town of Worth Matravers, site of one of the top secret radar installations that ringed Britain’s southern coast. It was here that my Dad met my Mom. The German Blitz on London began in September 1940 resulting in widespread destruction and disruption. Planning and even communication became constrained, if not impossible. The military intelligentsia, known collectively to the British as ‘The Boffins,’ regularly met in Worth Matravers in a bunker carved out of an old beer cellar in The Square and Compass Inn. Locals, including my parents, spoke of having a pint of an evening when a motorcade would draw up outside and several high ranking military and political men would stroll in, grab a few pints, and then disappear into the basement for the rest of the evening. By morning they would be gone. It was in this pub, following a two month courtship, and a marriage ceremony at the nine hundred year old St. Nicholas, that my parents spent their wedding night. It was to be the only night of their newly married lives as Dad and his regiment shipped overseas to Africa the following day. He would not get back to England and my Mom until 1945 when the war in Europe was over. Dad did not speak much about the war. He told me of the young cheetah cub he kept as a pet in Kenya after its mother was killed for raiding their camp one night. Dad liked Kenya, and often spoke of wanting to retire there. He was by now in charge of a Kikuyu regiment of the King’s African Rifles. Mom would speak of Dad barking orders in Swahili as he slept and of his recurring bouts of malaria long after he returned to England. He told me of tracking some Italian prisoners who had escaped. They found their boots on the banks of a crocodile infested river. He told me that he had watched helplessly as a friend of his died from drowning after the boat they were in capsized in the Indian Ocean off the coast of what is now Bangladesh. After the African campaign was over, now acting major in charge of the motor pool, Dad was reassigned to the Burmese front, seeking to keep the Japanese from coming over the Burmese Hills into India. All the British airfields in Burma had been destroyed by the Japanese, so the forward base was in Cheringa, in the southern panhandle of Bangladesh. The British built a railroad bridge across the Karnaphuli River to connect the port at Chittagong to the airbase in Cheringa to move supplies to this forward base where Dad was stationed. Both the bridge and the airstrip still stand, as does the tiny cemetery in Chittagong where many of my father’s regiment are buried. Dad hated Cheringa and called it the armpit of the world. But he was tough and resourceful, and survived that assignment, as he had survived so much in his young life. Returning to England after the war, now 28 and retired from the army with medals and honours, Dad was able to finally take up married life. He and Mom settled in Colchester, where there was an engineering firm and the prospect of stability, and began a family. Five years, two miscarriages and one infant death later, Mom and Dad with their three surviving children were established at 52 Turner Road in Colchester just across the street from the General Hospital and not far from High Woods Country Park. It was, and still is, a lovely place to grow up. But it was not cheap. And promotions and opportunities were slow in coming. Looking to support his young family, Dad undertook to move us all to Canada when I was six. He has been offered a job with Dorman Diesels, a British firm with a growing presence in North America. Dad rode the success of that expansion to General Manager and a very comfortable lifestyle that I enjoyed throughout my teenage years. He worked long hours on the way up, travelling to remote locations in Eliot Lake and even further north to sell diesel engines. But he was not an absent father. Dad was a kind and genial man. I can’t think of a single picture of him where he doesn’t have a lopsided, optimistic grin. Life had thrown a lot of mud in his direction, but he had learned to make pies of it, and was comfortable in his competence. Nor was he much of a man to complain. He had his first heart attack when he was 39. We were driving down Eglington Ave in Toronto at the time, all five of us in the car when he suddenly groaned and clutched his chest. He calmly pulled over to the side of the road, recovered his breath, assured us that everything was alright, then eased back into traffic and drove on as if nothing had happened. He never did go to the hospital. That’s the kind of man he was. He was also a very careful man. He worked on this one model of the Cutty Sark for about six months. He carved masts from dowels, fashioned rigging from string, turned miniature pulley wheels into turnbuckles. He was inventive and he was patient. Everything had to be to scale, and painted in the correct colours. I would read in the living room while he worked, absorbing his attentive manner by osmosis and stealing furtive looks at his craftsmanship. Ask anyone who knows me how attentive to detail I am. This is where it comes from. But model boats weren’t his passion, model trains were. He built his layout from scratch in the basement of our house on 19 Larabee Crescent. It was only four by eight, but it was built in ‘O’ gauge so there was plenty of room for several tracks and stations. He built ramps, and formed hills. He built the station yards from balsa wood. All of the switches were electrically wired and brought back to a control panel with dozens of switches and relays. I remember staring up at the maze of colour wires and marveling at the capacity my father had for detail. When we sold our house on Larabee and moved to Weston, there were three buyers from the crescent lined up and bidding for the layout. In England, in a smaller house, he moved to ‘N’ gauge, and continued his same care for authentic detail to the end of his life. Dad was also a very literate man. Not fond of novels, he read the Globe and Mail from cover to cover every night, and the New York Times on the weekend, finishing with their famous crossword. Perhaps the latter explained his prodigious vocabulary. When he scolded us, it was an education in itself. When he was pleased with us, he would recite entire poems by heart, and had a quirky sense of humour and a talent for accents that would come out when recounting old Stanley Holloway monologues like ‘Albert and the Lion.’ He also had a fondness for drama, which he and Mom exercised as members of the Don Mills Players, which garnered some attention in Toronto in its day. I remember one night he and his good friend Dino Voyatzis coming into the rec room one evening asking my brother and I which one of us could belch on demand for an upcoming role. I don’t think that production ever saw the light of day. When we moved to Etobicoke, he built a model car set for his two boys from scratch. He carved out the track on Masonite with a router, and laid down aluminum strips that he wired to conduct electricity. It would back on itself with ramps and overpasses and my brother and I were the envy of the neighbourhood. The three of us would go off to track meets with our race cars with their custom tires that Dad had a business contact make for him. We invariably won; my brother more often than I. We were older then and looking forward to driving for real. Dad insisted that he teach us, for driving was what he loved best. And man could he drive! He never raced, and he was certainly never careless, but he brought that same attention to detail to driving as he did to everything else. He hated automatics, and thought them useless in the cold weathers of Canada. But if you sat in the back, you would never know he was going through the gears, he was so smooth. He logged every mile, and every drop of gas. He could tell you to within a fraction his gas mileage for every mile he drove. He knew every road in Toronto and the easiest way from any two points in town. He was never flustered, and never had a single accident in his entire driving life. He said as he was teaching me to drive that if I didn’t know what every driver was doing or was about to do for a mile up the road and half a mile behind that I had no business being at the wheel. Once, as he was teaching me to drive, we passed a line of parked cars and he asked if I had looked under the wheels to see if I could see the legs of any children running onto the street. I shamefacedly admitted that I had not looked. He had me pull over and drove home himself. If I wasn’t going to listen to his instruction, what was the point of him teaching me? He taught me to set the outside mirrors as cars passed so there was never a blind spot, and that the straightest distance between two points was a straight line whatever the white paint might say. When Dorman Diesels closed its North American operation, Dad was forced to move back to England to keep his pension. They settled in Lincoln, which I loved to visit. Dad thrived in the ten years he had before retirement, and worked hard to meet the needs of the company’s clients. After he passed away, Mom showed me letters he had received on his retirement from all over the world; dozens of them, all thanking him for his courtesy and helpfulness. 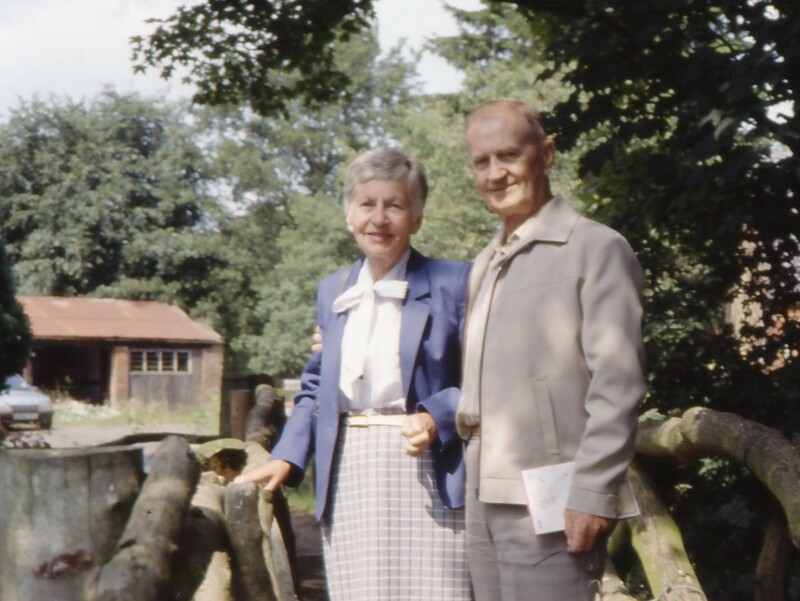 He and Mom enjoyed their retirement, traveling throughout England on the back roads, staying at little inns they found and enjoying their time together. He had loved his children as we were growing up, but perhaps his desire to see us grow up right might have constrained that love from flowering. He had no such constraints with his grandchildren. When he and Mom visited us in St. Thomas, Liz was almost two, and well able to walk. She never got a chance to while he was with us. She was in his arms the entire time, walking or sitting with a big silly grin on his face. He only put her down to eat and sleep. He died like he lived, an absolute gentleman. Racked with pain from the cancer that was ravaging his body, his only thought was that I should seek to bring about reconciliation between my brother and my mother, something I was never able to do. He never spoke about himself; he never spoke about his pain. We were living in Europe that year, so our children got to visit a couple of times, the last during the March Break. Dad was in a wheelchair by then, only able to walk a short distance. But he fully enjoyed that visit. He passed away the following month, just after Mom’s birthday. Just like him to wait. On my last visit with him, just days before he passed away I finally got a chance to speak to him of my faith, and ask his permission to allow a Christian pastor I had come to know to visit him in the hospital. Perhaps his time in a Christian hospice during his final few months had softened his heart to God, for he agreed. I learned later that this pastor had brought about his reconciliation with God, and that my Dad died trusting Him. I trust that this may be so. I would like to think that in heaven I would get the chance to see again the man that has so shaped my life. If I have any civility in character, any forbearance in the face of pain, any kindness to strangers, any courtesy to women, any determination to never settle for anything less than the absolute best in everything I attempt, I owe that to my father, who was born on this day, October 12, 100 years ago. Oh Steve…what a wonderful tribute to your Dad. Wow…100 years…It certainly gives a lot of insight into the man you are today…and I know you have passed these traits on to your children as well. It was like reading a historical novel…and a marvel of how your Dad started out his life and in spite of it, he became such a success. His Mother must have been a very strong woman as well as his wife..your dear Mom who I’m sure also contributed to the person you are today. On a lighter note, it explained your driving..LOL…and Jon’s love of cars as well! Steve, what a beautiful tribute to your father whose example has definitely mounded and you. As you described your father, I was thinking to myself that you are SO like him. And the ending to your story, a glorious, happy ending, has left me in tears. How blessed you are to have been his son!